I bet you can guess what happened right? Because I was consistently NOT listening to my body, the pain got worse. There were daily migraines, full-body pain and a constant nauseating feeling about all the work I wasn’t doing any moment that I actually let myself sit on the couch, sleep or lie in bed just waiting for the pain to subside. Now I’m not telling you this for a pity-party, or to simply sob to you through a blog post. I’m sharing it because I want you to know that whilst on the outside things might look like they were blooming - on the inside I was severely crumbling. My business was growing, but I just couldn’t handle it. As a result, I was stressed to the max, had to turn away dream clients and even ruined relationships with existing clients because of it. I soon realised that this was NOT the dream business I’d thought I’d be running when I left my job two years earlier. It didn’t at all look like what I had put on my vision board, or journaled about. In a word - it SUCKED and I wanted so badly to give up on the dream. Once I could actually admit this to myself - I realised one clear fact. I’d fallen out of love with my business. Instead of the work fulfilling me, it was draining everything I had - so I knew it was up to me to make some changes to the way I was doing business. (Isn’t that the magical thing about running your own business - there’s no one else to blame, but also you’re in complete power to change WHATEVER you don’t like about your business!). So I wanted to share with you today some of the key learnings and changes I made, to turn my business from being something that was sucking my soul into something that felt sacred to me. Boundaries can be hard, don’t worry - I get it! Even when you’ve sat down and worked out those ‘hard line in the sand’ boundaries, it feels like you’re constantly being tested by the big-U dancing on that line asking ‘Are you sure this is really the boundary???’. When I’m online, how often I reply to emails and being clear the best lines of communications with my clients so all the important details are in the one place. For you this might be talking to your coaching clients about how best to communicate between sessions or what your email ‘office hours’ are and how soon they can expect a response. Creating a work-life blend that still allows you to show up and make your work sacred rarely looks like sitting at your desk for 12 hours a day, constantly checking emails during your down-time and having a phone that’s constantly buzzing with social media notifications. Try creating a schedule that puts your ‘lifestyle’ activities, goals and dreams FIRST and working your work around it - trust me, it will allow you to create a very sacred workspace for yourself. When you have clearly defined packages, whether that be your social media management offering or how many coaching sessions are included it creates a very clear boundary for your dream clients as to what’s involved in their purchase, and what’s not. The test here, is that when (yes, it’s not an ‘if’ it’s likely a ‘when’) your client then asks for something outside of that package you lovingly inform them of how they can purchase that … I find creating a script for these kinds of scenarios help conserve the energy that’s involved in writing those kind of emails. Putting a price-tag on your product or service can seem so hard - there’s all the mindset jazz that goes on wondering how much money your time is worth! But what’s even harder, is when you’ve clearly stated your price, and you have to have those difficult ‘Where’s my payment?’ conversations. Clearly outlining your payment processes and default processes can help minimise these situations, but again - I’d have a clear process and script mapped out, so you can calmly chat to your clients about payments outstanding. Having people in my team that I could quickly shuffle urgent tasks over to was a lifesaver. Even if you’re not ready to hire someone, get some more support in your business by implementing systems that automate some of your most time-intensive activities. Find a group of women that ‘get’ what it’s like to be the boss of your own business, trust me - it takes a unique breed of woman to truly understand it. These women will be your support system and the people you turn to when you need a good cry, celebration or even the occasional rant about why your Instagram numbers keep fluctuating! Just like creating beautiful boundaries - creating space in your business for yourself is an important line in the sand to draw. Personally, I realised that my creativity is not on tap - I need space to be creative, both for my clients and myself. What this might mean for you is that if you’re a health coach, you’re also prioritising your own health. If you’re a life coach you’re seeking outside support as well. If you’re a creative (like me!) you’re creating space for your own personal creative projects where you can limitlessly express yourself. It’s also important that, whether you’re a coach or creative, that you have time blocked out for the things you want to do. That ‘bright-shiny-object’ list of projects you want to embark on, products you’re dying to create and collaborations you want to dive into likely isn’t getting any shorter - so it’s important to make space for these activities as well as your clients!!! Consider it putting your own oxygen mask on first! So darling one, do you feel like your work is sacred? Or are you constantly being pulled this way and that, having your energy drained? I want to help you create a business that lights you up, feels sacred and special each moment you get to spend at your desk crafting your business. That’s why I’ve created a 12-week online immersion into creating an aligned and soul-filled business. 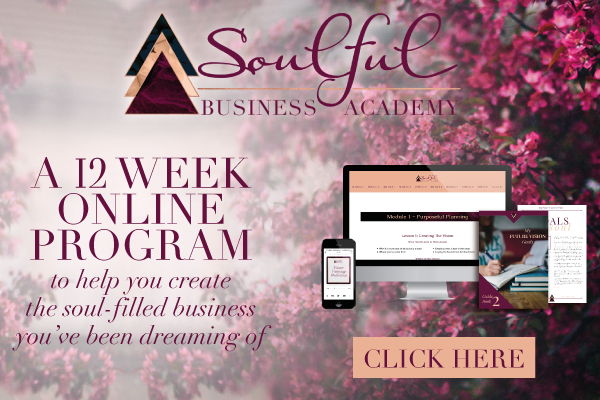 It’s called Soulful Business Academy - and I’d love for you to join!